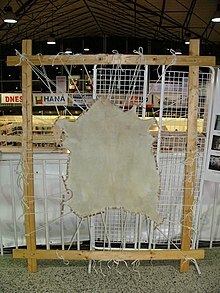 Pairchment is a writin material made frae specially prepared untanned skins o ainimals—primarily sheep, caufs, an gaits. It haes been uised as a writin material for ower twa millennia. Vellum is a finer quality pairchment made frae the skins o kids, lamms, an young caufs. This page wis last eeditit on 2 Mey 2017, at 01:51.